People who have straight and healthy teeth tend to have attractive smiles and are less likely to have problems with discoloration, uneven wear and fractures. In other cases, people with irregular gum levels tend to have an unattractive smile. The reason why we call it a gummy smile is that the excess gum tissue makes the teeth look small and unattractive aesthetically. Do you have a gummy smile? 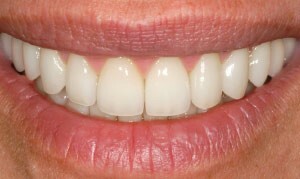 An optimal smile line is one that reveals the least amount of gum tissue when an individual smiles. Consequently, the gum tissue should have a balanced look in the smile line while making sure that they are properly aligned with your upper lip. 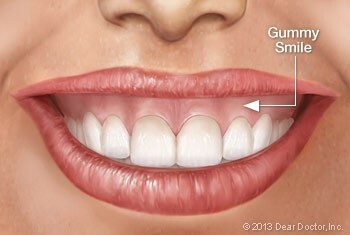 The primary reason why many people think their smile is unappealing is because they have a gummy smile. Hence, the individual might be hesitant to smile publicly. A gummy smile could develop on its own or as a cause of a more serious underlying dental problem. For instance, a gummy smile can be caused due to the way your new teeth erupted, or how your jaw developed over the years. This further causes issues as you might not feel comfortable having an unbalanced mouth shape. Many people are unable to take proper bites. All in all, this results in affecting the long term oral health and hygiene. Many people ask if a gummy smile is just an aesthetic problem or something beyond that. A smile line is an aesthetic zone which shows your teeth when you are smiling. There are other factors as well that might affect the appearance of your smile. The size and shape of your lips play an integral role in defining the beauty of your smile. Apart from this, your facial muscles, size and shape of the teeth, and gum tissue also influence the appearance of your smile. You will have an attractive smile if there is minimum gum tissue showing. If you leave it untreated, a gummy smile will not only negatively affect your smile aesthetics but also the overall appearance. Regardless, there is a cure for a gummy smile, which can be resolved by undergoing different dental treatments. One of the most effective methods to treat a gummy smile is dental laser treatment. In laser treatment, the dentist comfortably and efficiently removes all the excess gum tissue. This process also focuses on reshaping the underlying jaw bone. In this procedure, a concentrated beam of the laser is directed towards the excess gum tissue. What makes it more comfortable is that the laser does not produce any sort of vibration or heat. The dentist also makes use of a gentle spray of water to keep it smooth and steady. The procedure is not only comfortable but the post-procedure recovery time is much faster when compared to other treatment options. Combined with less discomfort, dental laser treatment is the best available option to cut away excessive gum tissue. Furthermore, the advanced technology of dental laser seals up the blood vessels automatically resulting in less swelling and blood during and afterward. Dental laser is a more suitable option for those who hesitate or are afraid of any dental procedures. The results of this treatment speaks volumes about how beneficial the method is. Moreover, you will get your original and attractive smile back. Let’s have a look at the benefits and risks of this treatment. People who have or developed excessive gum tissue or uneven gingival display can get their smiles back after the dental laser procedure. There are various benefits if you choose an experienced cosmetic dentist for your treatment. The dentist will be responsible to reshape the gum line, increase the length of your teeth, remove excess gum tissue, and produce a more symmetrical gum line. The only risk or complication that may occur is excessive bleeding or swelling. This is rare because of the advancements in technology but does not rule out that an individual might not face such issues. Apart from this, allergic reaction to anesthesia is another risk to dental laser treatment.